The Memory Foam Face Cradle conforms more comfortably to your face. 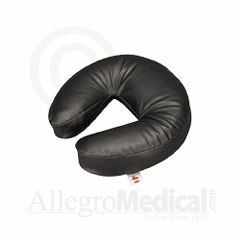 The Memory Foam Face Cradles has a resilient, therapeutic foam base and layered it with memory foam to provide added comfort. The cover is made with a durable vinyl that easily wipes clean. Memory Foam Face Cradles is made with the highest quality material in all of our products to ensure years of comfort and use. The foam is precision cut for more consistent performance. This cradle follows the industry accepted shape and is designed to work with most standard tables. Simply remove your current face cradle and secure our Memory Foam Face Cradle using the existing hook-and-loop tabs.